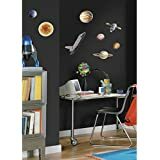 These are high quality vinyl wall stickers picturing planets, stars, satellites and space shuttles. These stickers are very easy to use (just peel and stick) and removable. It means you can remove them from one position and stick them to another position without leaving marks or sticky residue on the surface. They can even stick to windows, furniture, painted walls, mirrors, tiles etc with ease without falling on their own. You will be provided with 4 sheets containing 6 stickers each and so there will be a total 24 stickers with your purchase. These can be used on any smooth, dry and clean surface and these are also waterproof. These are good for kids who want to become future astrologers. Astrologers are really the people who study human behavior using planets in the solar system. Also good for kids who want to learn about the solar system. These stickers will look more better if there is a black paint on the walls as then it will create a night scene in the room. 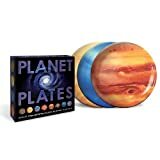 This is another great educational product based on the theme of solar system. This is a rug that can be used in kid's play room. This is a very high quality rug with all the planets of the solar system printed on it. There is also a large picture of sun and comets and small stars printed on it with almost black background. This has been really creatively designed and worth buying at any cost. Kids can easily sit and play with their toys on this playmate. All the 9 planets like mercury, venus, earth, mars, jupiter, saturn, uranus, neptune and pluto are printed on it with their respective characteristics designs. The picture of moon is also printed on it. 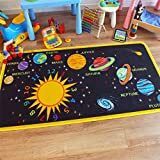 This rug is even good for astrologers who are studying the future and past of human beings (prophecy) through the position of planets in their horoscope. Its based on the theme of their business so its good for them and its also very colorful. Also good for people doing yoga and meditation. These plates can be used by parents to serve kids with food. There are total eight plates in the kit and each plate resembles one planet in the solar system. However, one planet Pluto is missing. This product is also meant to make kids learn through practicality. Eating food in such plates will make the children to enquiry what the planets are all about. The manufacturer also claims that the plates are dishwasher safe. If vertically held by someone and if some other person is watching the plate from some distance, the plate will actually look like a sphere to him. This happens as the design is so realistic and it is according to the theme of the planet. These plates could also be the center of attraction if used in kids parties to serve others. These plates are made from melamine which is a compound used to make high quality plastics. 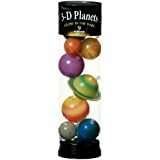 These are 9 small planets which are spherical in shape and comes in a tube. All the planets are made from plastic and they can be trailed from ceiling using strings provided along with the purchasing package. They glow brightly in dark room or at night and that is what really they are meant for. All the planets have their respective shapes and colors as mentioned in the study books and so these are also good for school projects. Adhesive putty is also provided to fix planets using threads at desired location.